The truth of the matter is that teaching isn’t a job for everyone. In fact, you should think long and hard about your reasons for becoming a teacher to determine if it’s the right profession for you. 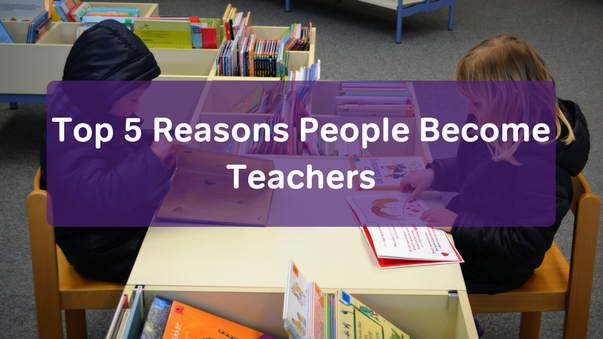 There are lots of reasons that you might consider, but here are the top 5 reasons people become teachers. Do you enjoy working with kids? Not everyone has the characteristics and skills needed to work effectively with children. If you enjoy working with kids, teaching is going to be more rewarding and enjoyable. However, if you struggle to connect with kids and struggle to handle behavioral issues and other problems, you may want to consider a different career path. It’s been said that variety is the spice of life. If you would struggle in a job that required you to repeat the same actions every day, teaching is a great option for you. As a teacher, you determine what your day looks like as you create lesson plans that work for your group of students. To create even more variety, you get a new group of students every year. This requires you to think on your toes and adapt to new personalities and obstacles every year. I’m a book nerd. I love writing, and I actually enjoy editing others’ work. As such, I knew that becoming an English teacher was the right option for me. I wanted to share my love of language arts with others and show how it can be fun, enjoyable, and relevant. If you have a love and passion for a subject, it’s fun to spend your day talking about it with others, making teaching a great career option for you. Speaking of fun, teaching is fun! I grew up playing school with my siblings and friends. As I got older, I enjoyed volunteering for opportunities that allowed me to teach. Why? Because it was fun. For people who are willing to put in the work and find joy in the journey, teaching can be a lot of fun. If you’re looking for a career that will keep you coming back every day, it’s important to do something that you’ll enjoy doing day in and day out. For many people who choose to become a teacher, they were lucky enough to have a teacher that positively impacted their life. Now, they want to pay it forward and make a difference in the lives of others. You may hear that people want to encourage, inspire, or impact their students. Teaching can be a rewarding experience, giving one a sense of purpose in their life. There are lots of great reasons people become teachers. Depending on your reason, you may find that it’s the perfect career option for you. Otherwise, it would be wise to look for another career path that you’re better suited to. So why do you want to be a teacher? What inspired you to consider teaching? Share your thoughts in the comments below.